If you’re reading this, thank God. That means I finally published this thing. That’s it. Those seven words have gnawed at me and have been at the forefront of my mind for the last few months. I couldn’t get them out of my head. I wrote those words down in big, bold letters on the front page of my work notepad. I set it beside my desk as I worked as a reminder to focus on the task in front of me. It became sort of a mantra for me as I try to get on my feet here in Nashville. I knew I wanted to write something based on those words, but what I thought would be a routine blog post turned into a huge struggle for me -- now I know how Apollo Creed felt in the first Rocky film, expecting an easy fight but then ending up getting pounded with body blows for 15 rounds. There’s just a little less blood involved when it comes to writing. Each time I sat down to write, the words just fell flat. There was a disconnect, I felt, between what I was writing and what I was doing. For a writer, that is a dangerous place to be. That’s when life’s dashboard lights start flashing and it’s time to take inventory of some things. But instead of dealing with that disconnect, I ignored it. I’d have opportunity after opportunity to face the problem, but I just didn’t have the courage or the heart to face up to it. Here’s the problem: We don’t like to focus on the problems or issues we’re dealing with -- at least not for too long. We know it’s a problem. We know it needs to change. But it’s ugly. It’s messy. And we don’t like to look at ugly or messy things for too long -- especially if it’s something ugly in ourselves. Sometimes it's fear that breaks our focus. Other times it's pride. Heck, it might be something as simple as laziness. Whatever that barrier is, we have to get over it. We can only hide or run from it for so long before we have to deal with it, whatever “it” is. 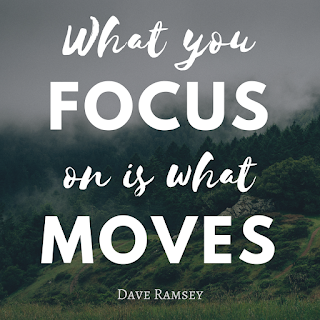 What you focus on is what moves, yes, but first we have to be willing to actually focus on it. To stare at it. Acknowledge it. And then lay it down at God’s feet, unpacking it brick by brick. Only then will it move. Only then will we see the progress and momentum we’ve wanted to see all along. I can still remember the moment I walked through the door of my new apartment in Nashville for the first time. There’s something simultaneously exciting and overwhelming about that first look. The exciting part is the idea of getting to fill the place up however I see fit. The overwhelming part is thinking about all the work going into doing that! The first thing that struck me was the emptiness. The off-white walls. The clean carpet. The stillness and silence. An empty apartment is basically a blank canvas. You get to make it your own. That emptiness was an invitation -- an invitation to fill all that empty space. It doesn't matter who or what was there before. It's yours now. You get to arrange everything to your liking. You decide what your place is going to look like. It’ll take a lot of work to get it to where you want it to be, but at the end of the day it will be your space, one that reflects who you are in a number of ways. My first week in town was filled with conversations like Let’s have the bed face that direction... I like the bookshelf on that wall... I guess we could use a new toaster that doesn’t burn the toast every time I use it. I'm also pretty confident that I can sleepwalk through the Target near my place and find everything I need. Little by little, piece by piece, what started out as an empty apartment began to look like home. It was very exhausting (and expensive -- if you’re planning on making a move in the near future, start putting some money aside now! ), but it was also very rewarding, too. But just because my apartment was starting to look like home didn’t mean the work of creating a home was done. On the contrary, the real work was just getting started. In many ways, I’ve looked at this move to Nashville as an opportunity to start over and create the kind of life I want to lead. And that goes a lot deeper than sofa placement or what brand of coffee maker to buy. What you’re able to do in your own home is more important than what’s in it. What’s in your home and how it’s arranged should point you to what is most important in your life. 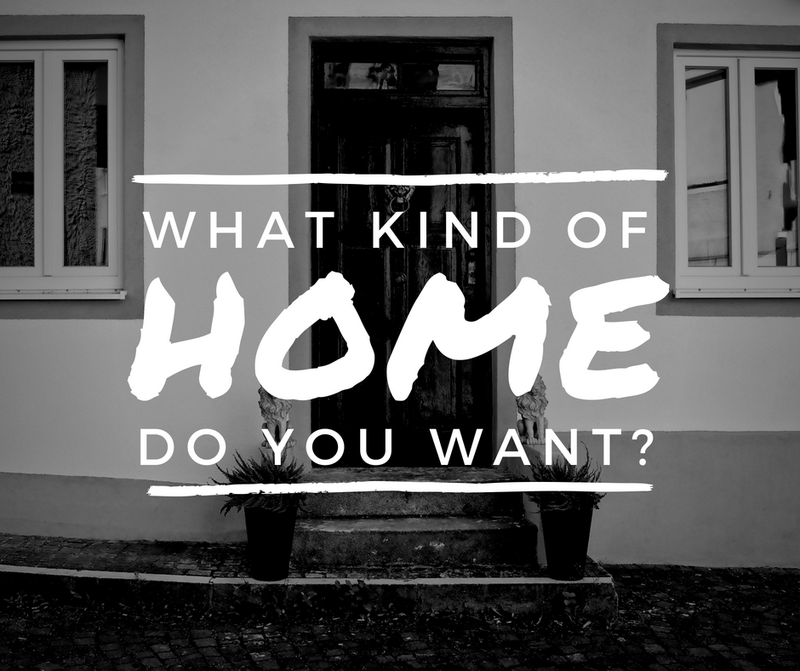 What kind of home do I want? How do I feel when I open the door after a long day at the office? If I invited someone over right now, how would they feel when they walk in? Am I able to create, learn and grow here? Am I able to rest, relax and unwind here? Am I able to worship, pray and reflect here? 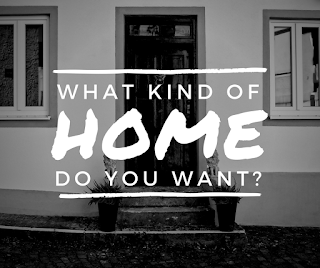 Is my home helping me live the kind of life I want to live? This move and trying to answer these questions has helped clarify what's important to me and to remove some of the things that have been cluttering my life for sometime now. But you don’t have to move halfway across the country to take stock of where you are. Whether you are just moving into a new apartment or you’ve been living in the same place for 25 years, take a look around -- not just at your space, but at your life, too. Take inventory of what’s there and what isn’t. What needs to be added? What needs to go in the trash or sold in a garage sale? What needs to be rearranged -- in your apartment and in your calendar -- so you can focus on what’s important? Taking those little steps, no matter what situation you’re in, can make you feel like you’re home - no matter where you are. I Don't Know. And That's Okay. He also desperately needed a copy editor, though, but don’t we all? I brushed things up a little. I’m sure he wouldn’t mind. I think if we ended up in the same room and had a conversation without unraveling the fabric of the space-time continuum, we’d both laugh at how we pretty much ended up in an identical situation six years apart. I’d also thank him for being brave enough to take the leap and moving halfway across the country. That was big for us. I wouldn’t be as comfortable doing what I’m doing now if it wasn’t for that experience. I think he would be proud of all the progress we’ve made over the past six years. I think he would be surprised that we’ve ran three half marathons, traveled to Alaska and interviewed Martha Stewart for two minutes in the six-year gap between us! We’d be sad over some of the dreams that didn’t quite work out as well as we’d hoped, but he’d be happy to see how much more he is willing to take risks and put himself out there. He took that first, big one, though. I think 21-year-old Joel would encourage the current me to be a little bolder, though. To get back to the heart of things. To chase after God a little more fervently and cling to Him a little more desperately, the way he did when he first moved to San Antonio. He’d say that some of the missteps, disappointments and struggles that have occured during the six years between us is over now. Let them go. Leave it behind. Charge ahead. Let’s make the next six years the best years we possibly can. I’d tell him that that sounds like a good plan. Sorry, that was kind of a long author’s note. Hope this post speaks to you the way it did to me just now. "This is what the Lord says: 'When seventy years are completed for Babylon, I will come to you and fulfill my good promise to bring you back to this place. For I know the plans I have for you,' declares the Lord, 'plans to prosper you and not to harm you, plans to give you hope and a future. Then you will call on me and come and pray to me, and I will listen to you. You will seek me and find me when you seek me with all your heart. I will be found by you,' declares the Lord, 'and will bring you back from captivity...'"
Chances are you've heard Jeremiah 29:11, the part that I did not embolden in the scripture above. It's one of the most encouraging and popular verses in the Bible; a reminder that God is in total control, that He is good, and that He has a good plan for our lives — even when we don't always see it. But I was brought to this passage a few days ago and I began reading around the verse. I love verse 11, but what about verse 10? When the Israelites were exiled and put into captivity, I imagine there wasn't much hope in their camp. The Lord told them that when seventy years were completed in Babylon, then He will come and fulfill his good promise. Seventy years? I don't know about you, but that's a long time to wait. We love that God has a plan and future for our lives, but are we willing to wait on him for it? Am I? Or do we want God to fulfill His promises and plans as long as they fit into our own plans and desires? I like to plan ahead, or at least try to. All that seems to succeed in doing, however, is overwhelm me. Now don't get me wrong: having long-term goals is great. I have my own goals that give me a sense of direction for my life. But make sure that you don't take God out of that plan-making process. And sometimes, many times, the best course of action is to surrender the future to Him instead of trying to get into the little details of everything. Embrace the vision God has placed in your life and just let Him take care of the details. How long have we planned ahead for? A year? Three years? Five? Ten? We can make all the plans and charts and projections we want... but if God has another plan, are you willing to throw your own away? It's a choice we all have to make. We all have to answer the question God always seems to be asking of us: "Do you trust Me?" And then there's the couple verses after verse 11. There's a lot of action taking place in those couple sentences. Call. Come. Seek. Find. Listen. Pray. Our faith cannot afford to be inactive and passive. In order for us to realize God's plans for our lives, we have to move. We have to take action and take that critical step of faith. That's often the hardest thing to do. I don't want to be the person who doesn't take those steps. Sometimes it's easy to just sit back and take the easy route instead of making the kinds of sacrifices God is asking us to make... Our faith needs to be fueled by action. What it all boils down to is this: I don't know where God is going to have me in five years. Or 10 years. I really don't. But I do know that God is going to be with me through it all. And that's all I really need to know. Leaving Miami has been on my mind for some time now, but it wasn’t until last summer that it became clear that it was time to go. I had just spent a great weekend with several friends in Orlando (Fact: Any weekend that includes SeaWorld is a great weekend), and as I was exiting the Orlando city limits and following the highway signs pointing me back toward Miami, an interesting thought flashed brightly in the forefront of my mind: I really didn’t want to go back. I wanted to turn the car around, stay in Orlando and just start over there. As I fought back the urge to go A.W.O.L. and continued driving south, I started to reason with God and with myself on the idea that Orlando was where I should be: The traffic is not as bad... and there’s SeaWorld! I can actually afford SeaWorld annual passes. Some of my closest friends live here now and it’s not too far from home. If I wanted to go home for a weekend, it’s only a four-hour drive away. This makes a lot sense. Shortly after arriving back in Miami and getting my master’s degree, I applied for several job openings in Orlando… and then one in Nashville. I’ll let you take a wild guess which one got back to me. And that leads me to some personal news I’d like to share with you all: This weekend, I will be moving to Nashville, TN. Goodbye, Magic City. Hello, Music City! 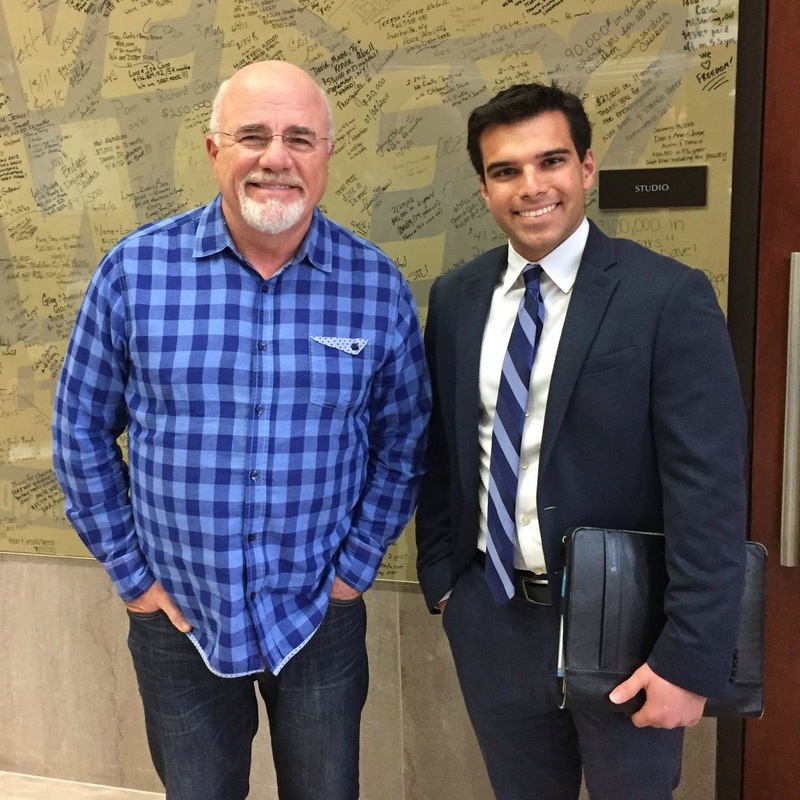 I’ll be joining the writing team at Ramsey Solutions, which helps millions of people everyday get out of debt, set financial goals and build a legacy. And anyone who knows me knows I’ve been a huge Dave Ramsey fan for years, so this is an exciting opportunity for me! Their work has changed my life for the better, and now I get to create that content myself. It’s a dream come true. There’s one thing that this whole process has taught me: Our first choice isn’t always the best choice. Proverbs 16:9 says, “In their hearts humans plan their course, but the Lord establishes their steps.” We might have one idea, but God usually has a better one in mind. God sees the bigger picture. He sees things we often can’t even see for ourselves. And I am so thankful for that! We can plan our journey and chart a course for ourselves all we want, but if we want to truly discover where we were meant to be, we have to let God lead the way and correct our course whenever He wants. Whenever I’m facing a big decision or a dilemma, I pray a simple prayer: Lord, close the doors you want to close and open the doors you want to open. I’ve prayed that prayer a lot over the past few months. It’s a simple prayer, but not always an easy one, because that means consciously putting your first choice on the altar and being open to something else entirely. Praying that prayer means you’re looking for God’s will to be done in your life instead of your own. There have been doors that I really, really wanted God to open, but they remain stubbornly closed. But then another door creaks open elsewhere. And walking through that door requires a lot more of us. God often opens doors that will force us out of our own comfort zone. Walking through those doors will require us to trust Him more than ever before. When God calls us to go, it’s time to go. And if I have questions and doubts and fears? Good! Now is the time to bring all of those to Him. If we want a faith that is strong, we have to let our faith be tested. This move is going to require a lot more of me than a move to Orlando would have. I don’t really know anybody in Nashville. I’m leaving a job that I love at FIU, a university that has given me so much and has always felt like home. And Nashville is 700 miles further away from home than Orlando is. I feel like God was saying to me, "If you're going to do this, Joel, you have to go all in. Go the extra 700 miles." Nashville is going to be a huge transition and transitions (change in general, really) have always been a big fear of mine. But transitions, if we let them, can the best thing that could ever happen to us. Transitions force us to change, to grow, to adapt. They force us to ask the big questions and define the kind of lives we want to live and figure out how to get there. They force us to ask for help, to take stock of the things we too often take for granted in our everyday lives. Transitions make us realize what is truly important to us. Where is God calling you to right now? Where is he asking you to be strong and courageous in the face of the unknown? He’s reminding time and again that He is still right here with us, and He will be with us over there, too -- wherever ‘there’ is. 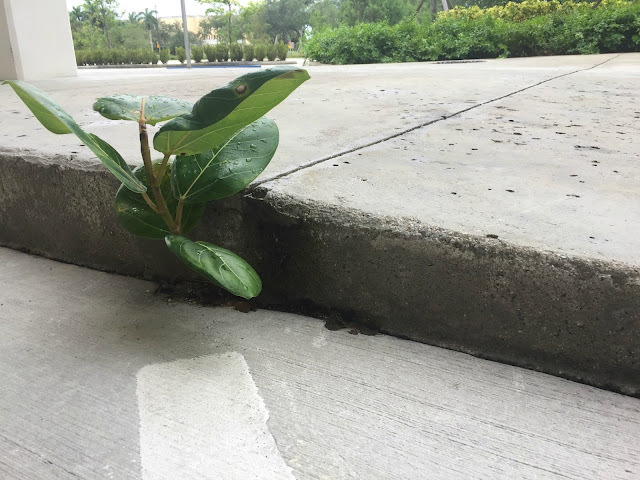 Those were my thoughts when I saw this small, green plant that had sprouted out of a crack in the concrete of a parking garage near where I work recently. It surprised me so much I had to stop and admire the little thing (I’m easily amused, what can I tell you?). A few questions ran through my head as I crouched down to get a closer look at it, but most of them boiled down to a simple one: How? Most of us can identify the type of environment where a plant can usually thrive. We would say some plot of dirt with good soil, access to water and ample sunlight would be ideal. A parking garage wouldn’t make my top 10 of ideal environments for a plant. And yet, there it was. We should always be striving to grow, but there are times when you’ve probably felt like your growth has been stunted for one reason or another. I know I have. Maybe you’re stuck in a less than an ideal set of circumstances or a self-defeating mindset. Yet, this little plant in a parking garage made it work. It didn't need much; just a crack in the concrete. It found a way to grow in a place it had no business growing in. So why can’t we? There are certain things we simply can’t control and it’s nearly impossible to grow if we’re always fixated on them. It’s also impossible to grow if we wait for our circumstances to magically get better. I've realized that I fall into the trap of waiting for 'perfect circumstances' way too often. If things aren't perfect at home/at my job/at church, my default is to choose a passive approach to growth instead of an active one if I'm not careful. Well, maybe if I wait a few weeks or months, things will get better, I'll think to myself. But waiting for the ideal rarely makes it real. And it certainly won't lead to growth. If you're in a season where you feel stuck or overwhelmed by circumstances, look for the cracks in the concrete. Sure, it might not be ideal, but it's still an opportunity for growth. You can grow in whatever job you have now. You can grow no matter what your relationship status is. You can grow in whatever city or town you find yourself in. It might not be easy, but it is possible. We don't need perfect circumstances to experience growth -- we just need a crack in the concrete.